With the Daesh blockade of Deir Ezzor broken, the Syrian Arab Army (SAA) continues to make progress in freeing the Euphrates valley from Daesh, whilst continuing the struggle to liberate Idlib governorate from the grip of the al-Qaeda-related al-Nusra Front and establish full control of the M20 highway running north-east from Palmyra to Deir Ezzor. Imperialism, made desperate by the looming prospect of defeat for all its dreams of regime-change, is now tying itself in knots pretending to fight the terrorists whilst ever more brazenly seeking to undermine the genuine anti-terror efforts of the SAA and its staunch allies. It is doomed to failure. In late September, Major General Konashenkov, speaking for the Russian Defence Ministry, reported that the US-backed Kurdish militia of the Syrian Democratic Forces (SDF) had twice attacked the SAA in the Deir Ezzor governorate with mortar and rocket fire. Noting that drone surveillance had failed to record any actual confrontations between the SDF and Daesh in Raqqa (where meanwhile US-led coalition bombs take an ever heavier toll on the captive civilian population), he accused the SDF of putting its Raqqa operation on hold so its forces could concentrate on disrupting the SAA’s own operations around Deir Ezzor, contesting control of oil fields in that region (‘Russia warns US it will strike back if militia attacks in Syria don’t end’, RT, 21 September 2017). In spite of these and other ‘friendly fire’ provocations, by the first week in October the SAA had moved within seven miles of the city of al-Mayadeen, where Daesh’s command structure is based. SAA artillery was backed up by Russian airpower, complemented by the launch of ten cruise missiles from Russian warships in the Mediterranean. Commenting in October on the repeated pattern of ‘friendly fire accidents’ which serve objectively to slow down and complicate the liberation of Syria and criminally prolong the sufferings of the Syrian people, Konashenkov stated bluntly, “We have repeatedly pointed out that the major obstacle to the complete elimination of IS in Syria lies not in the fighting capability of the terrorists but [in the fact] that American colleagues are supporting them and are ‘flirting’ with them.” He added that the recent well-coordinated actions of the terrorists show they have intelligence data that can only be obtained as a result of air reconnaissance. For example, in a terrorist attack against the SAA in Homs governorate on 28 September, a large terrorist unit successfully bypassed all the army’s hidden outposts in the area, a feat that could only have been pulled off if the terrorists had been given the exact coordinates of each outpost. Meanwhile on the very same day, 28 September, there were terrorist attacks on the M20 highway connecting Palmyra and Deir Ezzor, a crucial supply route for SAA operations in the Euphrates valley. Happily, in both this attack and the one in Homs province, the enemy was successfully repelled – but no thanks to the US coalition. As Konashenkov drily concluded, these attacks “have only one thing in common: all of them originated from a 50-kilometre zone surrounding the city of al-Tanf on the Syria-Jordan border.” Al-Tanf just happens to be where the US-led coalition’s military mission is based (see ‘ISIS attacked Syrian positions from US-controlled area, used sophisticated data – Moscow’, RT, 4 October 2017). Yet, by whatever tricks imperialism strives to prolong a war which it cannot win, all Syria’s neighbours can see with their own eyes which way the wind is blowing and are tacking accordingly. Ankara, still smarting from a coup attempt which was perceived to be US-backed and now horrified to see the US entrust a Kurdish catspaw to pull out the chestnuts in Syria, has shifted its geopolitical bearings radically enough for Sergey Lavrov to be able to say that Turkey, along with Iran, plays “the key role in terms of stabilising the situation in Syria and Iraq” (‘US staging “fatal provocations” against Russian forces in Syria – Lavrov’, RT, 3 October 2017). Jordan, too, is seeing on which side its bread is buttered. Back in 2015 terrorists seized the Nasib border crossing and have controlled it ever since. Now that this is in the de-escalation zone, Jordan is demanding that control of the border returns to Damascus, restoring the lucrative commerce along that route. If the terrorists refuse to play ball, Jordan is threatening to bypass the Nasib crossing entirely and open up another crossing in Syrian government-controlled Sweida province instead. As the news source Reuters concedes, “The possibility of the crossing being reopened underlines just how far the scales have tipped in favour of Assad, who is steadily winning back territory with Russian and Iranian help, forcing neighbouring states to rethink their policies” (Suleiman Al-Khaldi, ‘Syrian rebels resist Jordan pressure to hand over border crossing’, Reuters, 5 October 2017). Meanwhile the Gulf States continue to descend in a spiral of mutual recrimination over who was responsible for losing the war, effectively having thrown in the towel. Now even the arch reactionary Saudi monarch pops up in Moscow to swear support for a peace settlement in Syria that would preserve the country’s territorial integrity, as if six years of striving for the complete opposite were but a passing dream. And even the West’s pernicious tactic of seeking to alienate Syrian Kurds from their loyalty to a united and non-sectarian Syria, setting an agenda for the Kurdish SDF quite at variance with its original defence of Syrian Kurdish communities from Daesh terror gangs, may not work out as imperialism hopes. Whilst Moscow and Damascus have justifiably harsh words to say about the ambiguous role currently being played by the SDF, it is the imperialist manipulation of Kurdish national aspirations that is fundamentally to blame. The Syrian foreign minister Walid al-Moualem has previously characterised the Syrian Kurdish struggle against Daesh as “legitimate” in the framework of preserving Syrian unity (not forgetting that the biggest contribution to that struggle is being waged by the many Syrian Kurds within the ranks of the SAA itself) see ‘Syria’s al-Moualem says Kurdish fight vs Islamic State legitimate’, Reuters, 8 May 2017. More recently, Walid al-Moualem remarked that the government is open to negotiation with Syrian Kurds who desire autonomy within Syria’s borders – once Daesh had been rooted out. As he put it, “This topic is open to negotiation and discussion and when we are done eliminating Daesh, we can sit with our Kurdish sons and reach an understanding on a formula for the future” (‘Damascus says Syrian Kurdish autonomy negotiable: report’, Reuters, 26 September 2017). Even before the final liberation of the Syrian homeland, Syria is starting to rebuild. 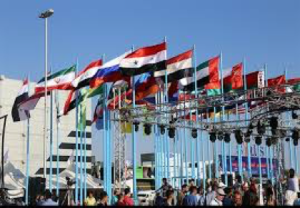 In a courageous move, the government decided to bring back to Damascus the International Trade Fair, an event which had to be suspended for five years because of the war. The only coverage of the event in the mainstream imperialist media was to report that a terrorist grenade had been lobbed at the Fair, claiming a number of lives. What these media failed to report was that, in defiance of this act of barbarism, the Fair carried on, and proved to be a roaring success. An article by a Swedish businessman, Ulf Sandmark, who attended the event in August gives a lively account which is worth quoting at length. “The incredible momentum of the Syrian Armed Forces in reconquering vast regions of Syrian territory from ISIS and other terrorist groups, is energising the Syrian economic recovery. With only four months’ lead time, the Syrian government organised the reopening of the Damascus International Trade Fair to kick off the restarting of the economy… It turned out to be a huge success, with exhibitors from 45 nations and overwhelming popular support, flooding the fairgrounds with 300,000 visitors a day. The Syrian people were eager to see the full scope of Syria’s productive powers—the famous Syrian food and textile industries, as well as the chemical and engineering industries. There were also two pavilions relaunching the Syrian heritage of artisans and handicraft. On display were the industries that had been kept going throughout the war, in many cases on a 24-hour basis, joined by restarted industries like the Khallouf Trading Company, which in February 2017 resumed its Hama car manufacturing plant in partnership with the Chinese Dongfeng Motor Company… Russia, beside all diplomatic, military and civilian aid, has restarted the coastal railway line and is aiding in the restarting of the petroleum industry. Iran is committed to bring industries, like the one they restarted in 2015 for the production of the Syrian car Sham. China will help rebuild all airports, then the railway system, and subsequently the highway system. “The reconstruction of the devastated areas, that used to be occupied by the terrorists, is now fully under way. Every damaged house we saw when travelling in the Damascus suburbs, was under repair, with new walls going up. This is the secret behind the success of the Syrian Arab Army. It is not only because of the support of the military allies, but because of a nation-building effort working for victory, with the Syrian population working non-stop to keep their nation functioning: the baker making bread, and health workers, teachers, and school kids doing their part to keep the nation going… No greater testimony to the broad popular support of the President can be given than this continuing mobilisation of an absolute majority of the Syrian people, including the millions of internal refugees who fled into government-controlled areas. It can also be seen in the accelerating national reconciliation process, which is bringing back thousands of former armed rebels to resettle and resume their citizen status, taking up their work in society and sometimes also in the army, to fight their former military allies. At least 600,000 refugees, mainly from Aleppo, have returned to their homes to rebuild” (Ulf Sandmark, ‘Syrian reconstruction ready for takeoff’, Executive Intelligence Review, 8 September 2017).